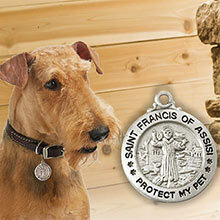 Give your pet the loving protection of St. Francis of Assisi, who taught compassion for the smallest of creatures. 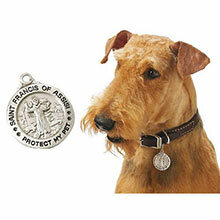 Silver-tone metal with embossed blessing. Clip for attaching to collar. Personalize up to two lines on on back: line 1 up to 8 characters and line 2 up to 12 characters. Tag approx. 1" dia. Place order by December 9th to ensure Christmas delivery.